Intel has today announced the arrival of the new Intel Xeon W-3175X processor is available from system integrators that develop purpose-built desktop workstations. The Intel Xeon W-3175X CPU provides an unlocked 28-core powerhouse is built for select, highly-threaded and computing-intensive applications and offers users the most cores and threads, CPU PCIe lanes, and memory capacity of any Intel desktop processor. – Intel Mesh Architecture, which delivers low latency and high data bandwidth between CPU cores, cache, memory and I/O while increasing the number of cores per processor – a critical need for the demanding, highly-threaded workloads of creators and experts. – Intel Extreme Tuning Utility, a precision toolset that helps experienced overclockers optimize their experience with unlocked processors. – Intel Extreme Memory Profile, which simplifies the overclockingexperience by removing the guesswork of memory overclocking. – Intel Advanced Vector Extensions 512 (Intel AVX-512) ratio offset and memory controller trim voltage control that allow for optimization of overclocking frequencies regardless of SSE or AVX workloads, and allow maximization of memory overclocking. – Intel Turbo Boost Technology 2.0 that delivers frequencies up to 4.3 GHz. – Up to 68 platform PCIe lanes, 38.5 MB Intel Smart Cache, 6-channel DDR4 memory support with up to 512 GB at 2666 MHz, and ECC and standard RAS support power peripherals and high-speed tools. – Intel C621 chipset based systems designed to support the Intel Xeon W-3175X processor allow professional content creators to achieve a new level of performance. – Asetek 690LX-PN all-in-one liquid cooler, a custom created solution sold separately by Asetek, helps ensure the processor runs smoothly at both stock settings and while overclocking. 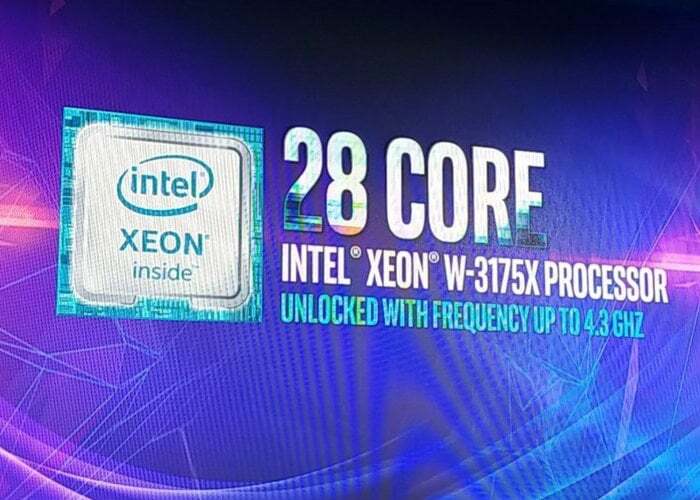 – With the Intel Xeon W-3175 processor, build the “Infiltrator Demo” in Unreal Engine up to 1.52x faster compared with the Intel Core i9-9980XE processor. – The Intel Xeon W-3175X processor is available from system integrators that develop purpose-built desktop workstations.